Sunday June 23rd, The St. Jude Dreamhome Giveaway!! We had so much fun at the WMCTV station today with Joe Birch, Ursula Madden, and some of our favorite ALSAC folks and SJ patient families! We also got to meet Katherine Sparks who was running things at the studio while we were at the news station; her husband Justin works with Craig at Vining and is one the guys who let Ingram shave his head back in the Fall. It turns out that they like his Ingy cut and have been keeping it that way ever since the original shave 10 months ago! It was a fun afternoon sitting around in the Green Room (which in fact wasn't green) talking with Roman and Leah's families and then moving into the conference room for unlimited snacks. While we were in the Green Room, both Ursula and Joe came in to get ready and we all had a fun time cutting up with them before everything got busy with the Giveaway. When we moved into the Conference Room, Ingram figured out that he really likes turkey (in big diced pieces) and that he doesn't like the "crust" on it; I guess that what we get for always cutting the crust off his grilled cheese sandwiches. We were there for a few hours total and both Ingram and Madison did a great job when the cameras were rolling. As expected, Ingram had everyone cracking up on AND off the camera; he even tried asking Mr. Birch if he could go ride in the helicopter and if he could pick out a ticket all while we were still on the air! Did I mention today was LIVE?? When Ingram was trying to ask about the helicopter while Joe was talking, the camera zoomed in on my hand trying to cover his mouth! Our kids may be used to cameras and all, but normally there's time for a little clean-up editing... but not today. At one point, Ingram had everyone in the room laughing (about 50 people); but, since the microphone was on the other side and the camera was on the four of us, all you could see was Madison and me trying not to laugh and Joe trying to get through his next sentence without laughing. It was a definitely a fun day. Even better, over a million dollars was raised for St. Jude with all of the tickets and donations, AND they sold out of tickets with an hour and a half of the show left!! Guess everyone better buy their tickets early next year in hopes of winning the Dreamhome or one of the fantastic prizes for 2014! For The SJ Dreamhome Giveaway!! Laying In The Middle Of The Kitchen Floor! Previously Aired During The Winter With Joe Birch. They Both Made a TV Appearance During The 2-Hour Long Show! While We Were Being Interviewed! "Is He Seriously Making Funny Faces At The Camera...Again??" Joe Birch Asked Ingram "Did You Know Your Sisters Are The Best Fundraisers St. Jude Has?" Ingram Finally Got His Turn! Madison And Ingram With Their Favorite Anchorman, Joe Birch! Monday to Saturday June 17th to 22nd, A Fish In The Making! Ingram had another fun week and had his first full week of swimming lessons without Mommy around! He went from barely being able to swim to swimming across the pool. We also practice swimming every night with Daddy and the girls and he loves showing them what he's learning. Before long, he's going to become a fish and grow gills because he won't come up for a breathe of air. Ingram has been riding his scooter around the neighborhood a lot and he likes to go fast! He has also been playing more tennis in the driveway and talking smack about how he knows how to play basketball. He seems to get his competitive side from Daddy and the girls because they're always talking about how they're doing this and that and can beat each other in a race of some sort. I've given up on trying to curb their competitive nature and just try to be the referee of it all. We've been so busy being "normal" that we haven't been back down to St. Jude for our Wednesday Speech appointments with Mrs. Angela. She probably misses Ingram's funny talks so I imagine we'll head back down and visit her for a lesson and see who all we can play with while we're there! We also had some friends over Friday night and all the kids has tons of fun swimming and playing together. The bad thing was that Craig's flight from New York had some unexpected issues and he didn't make it home for the party. The funny thing was that he cut it close in New York to be on a certain flight so he could be back in time for the party. Turns out, he would have been here earlier if he had waited to fly out later! The kids were pretty excited though when they woke up Saturday morning and he was home from his business trip. We played for a couple hours before he and Lindsey took off on their own business trip to Florida; this was Lindsey's first business trip and they were both very excited about it! Mr. Aaron and Mrs. Erin also came in town and made Daddy which Lindsey being gone a little less boring. We swam during the afternoon and then headed to Gracie Bleu for after-dinner goodies before bedtime. "Madison Don't Kiss Me!" Were Ingram's Last Words Before Heading In To Swim Lessons! Yes He Is Riding Down The Sidewalk In His Dinosaur Pajama Pants. Part Of The Pool Party That Happened While Craig Was Stuck In The Airport! Oddly Enough All Three Families Were Also Missing A Kid! As They Leave For The Airport! Mr. Aaron Throwing Ingram The Rocket With Madison The Catcher! Ice Cream With The Kids! Saturday and Sunday June 15th and 16th, Father's Day Weekend!! What a fun weekend!! First, we got to see a beautiful bride walk down the aisle and all the girls were mesmerized by her gorgeous wedding gown! They kept asking if it was time yet and then when they shut the doors of the church, they all turned around and grinned with the biggest smiles. It was so cute watching them and then when we were leaving, they were all talking about what their gowns would look like and their weddings. I'm not sure if we're ready for that...they're all only 9-12 years old!!! Ingram wasn't with us because he rode downtown with Mr. and Mrs. Wade to meet Daddy's self-admitted man crush, Tim Tebow!! He was speaking at the "Agape Shares Love" program at the Fed-Ex Forum and the Wade family had "Meet and Greet" tickets and asked if they could take Ingram with them. We caught up with them after the wedding and Ingram ran down with a football signed by Tim Tebow!! While he was back talking with Tebow, Ingram gave him one of his "Ingy Bands" and Tebow put it on right away. When he got on stage, Tebow was still sporting our bright green band and it was sooooo cool!! The girls all loved their front row seats and had so much fun listening to the guys sing and also listening to Tebow. What outing wouldn't be complete without a stop by TCBY for a late night treat! The other customers started laughing when we walked in with 6 girls (all around the same age) and Ingram at close to 10 o'clock at night. They really started laughing when they saw all the kids running around on the sidewalk and parking lot playing tag...at 10 o'clock at night!!! Father's Day started out with a breakfast picnic on the kitchen floor courtesy of the kids and then it ended with dinner at Steak and Shake after a long, fun day on the lake! The kids had a blast playing King of the Tube, but Beau didn't quite want to jump in the water. All three of the kids tubed together for the first time and the girls were doing stunts in the middle of their ride which turned into the end of their ride since they fell off. It didn't phase Ingram that he was by himself... until the tube started sinking when we slowed down; apparently the driver (Craig) didn't remember that from last year's tubing incident with all the cousins! Peanut kneeboarded and Monkey wakeboarded while Beau and Ingram watched from the safety of the boat. Daddy and Madison decided to try a new trick and both wakeboarded from the boat at the same time while I drove! Ingram was cheering, Lindsey was taking pictures, and Beau was resting on the floor. Oh what a weekend!! They're So Excited To See Haley Walk Through The Doors! Sitting Front And Center To Hear Tim Tebow Talk! From The Screen, We Got The Super Close-Up View Of Ingram's Bracelet On Tebow! The Autographed Football (Thanks To The Wade Family) And Happy Kids! These Girls Could Talk For Hours...All At Once!! Even Ingram Gets Thrown Off By The Girls!! Uh...Where Did The Girls Go?? One Boat + 2 Ropes + 2 Wakeboards = FUNNNNNN!!! Daddy Sitting In The Back While I Drive Super Fast!! Ingram And Beau Already Passed Out 30 Minutes Into The Drive Home! Losing a child to cancer is something that no one should ever have to experience, but it does happen. Nora Helen Tully, known to all of us as Helen, lost her battle this week and today was her service. Our girls were very upset when we told them about Helen, but Ingram doesn't quite understand it fully yet. With each friend that we've lost starting with Jayden, then Landan, then Cole, then Ashlynn, then Aaron; we have to keep telling Madison and Lindsey that it's not Ingram's cancer to reassure them that every cancer is different. We live in a different paradigm now and have since the phone call on April 3rd 2012, and it's a hard notion to understand. But, with each friend that loses a battle, it's harder for them to get a handle on it. We, as part of the cancer family, know that this is a possibility for all of our children; but when it happens, it is still a gut-wrenching position to be in...sitting in the pews with a child size casket in front of you. Ingram played with Helen all the time when he was at St. Jude. Most times Helen was with Mae, and Bailey while they were going to school and having their appointments. Helen, Mae, and Bailey did just about everything together because they were around the same age and Ingram jumped right alongside them anytime he saw any or all of them. They caused great mischief when they were together or all by themselves, and the halls of St. Jude were never quiet when they were around! We really got to know the Tully's while we were in New York for the "Thanks and Giving" campaign and our families had so much fun together. The girls and Helen were running down Times Square one night with Martin and Ingram chasing them; you'd think after a 2-hour-long dinner at an Italian restaurant, they'd be tired but they were more energized than ever! I also remember a day when Ingram had gotten a poke and picked out an airplane from the treasure box. This was no ordinary airplane either; it "squealed" as it flew and was so much fun to play with. Helen and her mother Andra were sitting outside the Kay Cafe talking with some folks when we came around the corner and Ingram ran as fast as he could to show Helen his newest treasure box find!! Those two flew that airplane all around outside of the cafeteria. Everyone that was walking by would stop for them to fly it, watch to see how far it went, then keep on walking after they made a comment like "Did you see that?" or "That sure was fast!" or "Did that plane make that noise?" This lasted at least a good half hour and for a 4 and 5 year old, that's a really long time. 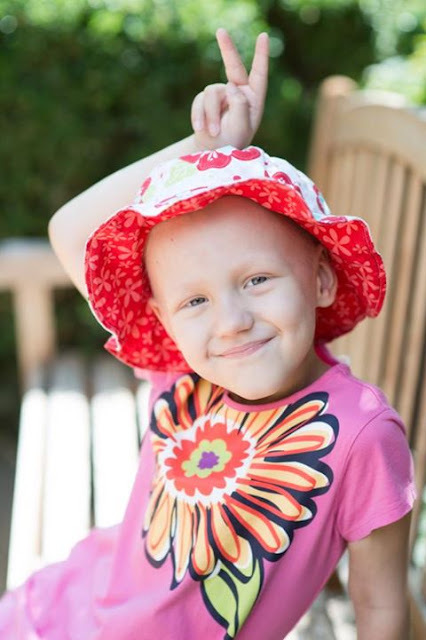 Helen had been fighting Rhabdomysarcoma since she was two years old and was "almost 6" when her battle was over. It's hard for us, but we cannot imagine how hard it is for Andra, John, and Martin. The only relief that we can try to have is knowing that she is forever cancer-free and is now in Heaven with her Creator. We pray that no more children will ever lose their battles with cancer and that the doors of St. Jude Children's Research Hospital will close forever because cancer has been cured. But until that day, we live each day knowing that our Heavenly Father loves Ingram more than we do and that when Ingram hurts, it hurts Him more than it hurts us. This Was Definitely A Happy Day! Reuniting In A New York Hotel Lobby With This Crazy Crew Of Girls And Ingram. And Mae And Bailey Are The Two Bald Beauties On The End! I Told You They Did Every Thing Together. Dinner Out With The Tully's In New York City! Martin, Lindsey, And Madison With Ingram, Helen, And Helen's Baby Doll! Lindsey And Helen Snuggled Up Talking At Dinner! It Was The Perfect Opportunity For Martin To Photobomb Them. She Pushed All The Buttons On The Elevator! At The Today Show Back During Thanks And Giving. Monday to Friday June 10th to 14th, First Ever Vacation Bible School! The beginning of summer has been so much fun!! Ingram and his girls have been having a blast being out of school and they're doing all sorts of fun stuff. They've been swimming, had the golf tournament, gone to the zoo, gone to SJ, and played lots of soccer with Daddy, but this week starts their "camps" for the summer. Ingram is now old enough to go to Vacation Bible School and he was so excited about going with his buddies from his Preschool class. Lindsey also got to go to VBS, but Madison had Goal Keeper camp at the University of Memphis all week. Since there were no nighttime obligations, Daddy and Madison snuck off for a few hours and managed to finally get Madison's new pair of glasses which she's been needing. Of course the most fun part was getting chocolate covered strawberries and a new pair of running shoes! Ingram had such a fun time at VBS the first day and even had his first real Play Date with his buddy Nolan! They rode home together from VBS and played for hours at Nolan's house. They had McDonald's for lunch, became Superheroes, and play outside before they had to go separate ways. I guess he was so exhausted from all that playing that when we dropped him off Tuesday, he melted down and it took forever to get him into his room. Oddly enough, Nolan had the same experience at the same time; these boys were out of their routine and already exhausted from a super fun full day together! We also had Nolan and his family over to our house to swim after VBS one day and Aunt Amye came down with Carley and Brett to spend the night too! It was super fun and we did lots of swimming with the whole crew and of course had a lot of ice cream to go with the fun! Nolan's Mom Got Outvoted 2-1 On McDonald's For Lunch! Spiderman And Batman Playing Air Hockey! Spiderman And Dragon Bouncing Till They Can't Bounce Anymore! Tugboat Nolan Pulling Barge Ingram! Brett Trying To Figure Out How To Get In The Mix! To Infinity And Beyond...Or At Least Over Beau! "Are You Sure You Know How To Drive This Thing?" And A New Pair Of Kicks! Saturday June 7th, Dreamnight At The Memphis Zoo! The whole crew got to go to our first ever Dreamnight at the Memphis Zoo! It's for patients and their families who have been LeBonheur and St. Jude hospitals and Special Olympics participants; it made the kids feel extra special getting running around the Zoo after normal closing hours. They had special exhibits open, face painting, art projects, kiddie rides, and of course hot dogs with all the trimmings. We ran into several friends at the zoo and of course spent forever at the massive playground! They even had some Monster trucks outside of the zoo that they cranked up after a few kids (including ours) begged and begged and begged. I don't think any of us were expecting it to be so loud, but at least we could cover our ears. The pour animals that started hollering in the background had no such luck!! It was a great night and we're so thankful to be a part of events like these that make Ingram and the girls feel so special for all they went through at LeBonheur and St. Jude. Roaring With Bailey And Her Mom Ashley! Daddy Helping Ingram Color His Lion On The Banner! It's Pretty Cool Because They Bring Out The Banners Each Year! Ingram Holding Daddy's Favorite Reptile....NOT!!! Hey Baby...You Want To Go For A Ride? My Ears! My Ears!! My Ears!!! Huffington Post Blog By Craig! !